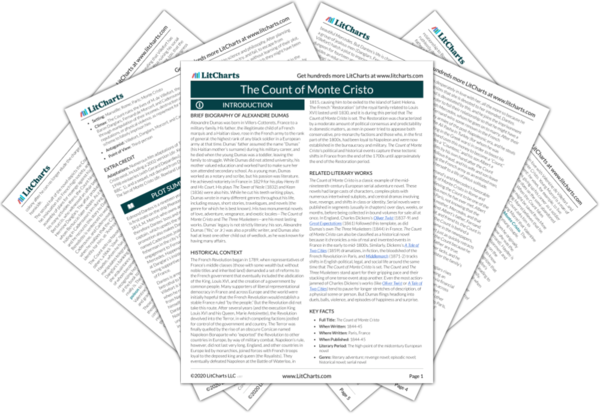 Instant downloads of all 946 LitChart PDFs (including The Count of Monte Cristo). 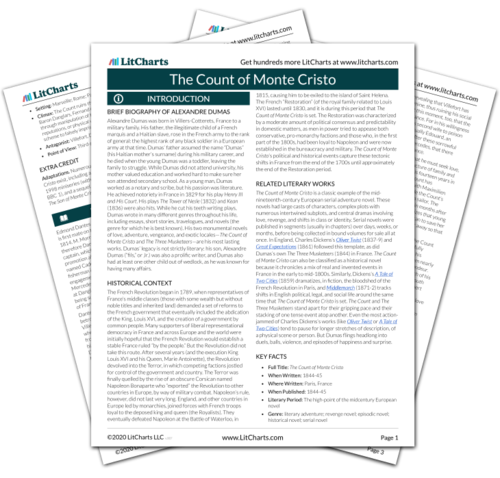 Welcome to the LitCharts study guide on Alexandre Dumas's The Count of Monte Cristo. Created by the original team behind SparkNotes, LitCharts are the world's best literature guides. A concise biography of Alexandre Dumas plus historical and literary context for The Count of Monte Cristo. A quick-reference summary: The Count of Monte Cristo on a single page. In-depth summary and analysis of every Chapter of The Count of Monte Cristo. Visual theme-tracking, too. Explanations, analysis, and visualizations of The Count of Monte Cristo's themes. The Count of Monte Cristo's important quotes, sortable by theme, character, or Chapter. Description, analysis, and timelines for The Count of Monte Cristo's characters. Explanations of The Count of Monte Cristo's symbols, and tracking of where they appear. An interactive data visualization of The Count of Monte Cristo's plot and themes. Alexandre Dumas was born in Villers-Cotterets, France to a military family. His father, the illegitimate child of a French marquis and a Haitian slave, rose in the French army to the rank of general: the highest rank of any black soldier in a European army at that time. Dumas’ father assumed the name “Dumas” (his Haitian mother’s surname) during his military career, and he died when the young Dumas was a toddler, leaving the family to struggle. While Dumas did not attend university, his mother valued education and worked hard to make sure her son attended secondary school. As a young man, Dumas worked as a notary and scribe, but his passion was literature. He achieved notoriety in France in 1829 for his play Henry III and His Court. His plays The Tower of Nesle (1832) and Kean (1836) were also hits. While he cut his teeth writing plays, Dumas wrote in many different genres throughout his life, including essays, short stories, travelogues, and novels (the genre for which he is best known). His two monumental novels of love, adventure, vengeance, and exotic locales—The Count of Monte Cristo and The Three Musketeers—are his most lasting works. Dumas’ legacy is not strictly literary: his son, Alexandre Dumas (“fils,” or Jr.) was also a prolific writer, and Dumas also had at least one other child out of wedlock, as he was known for having many affairs. 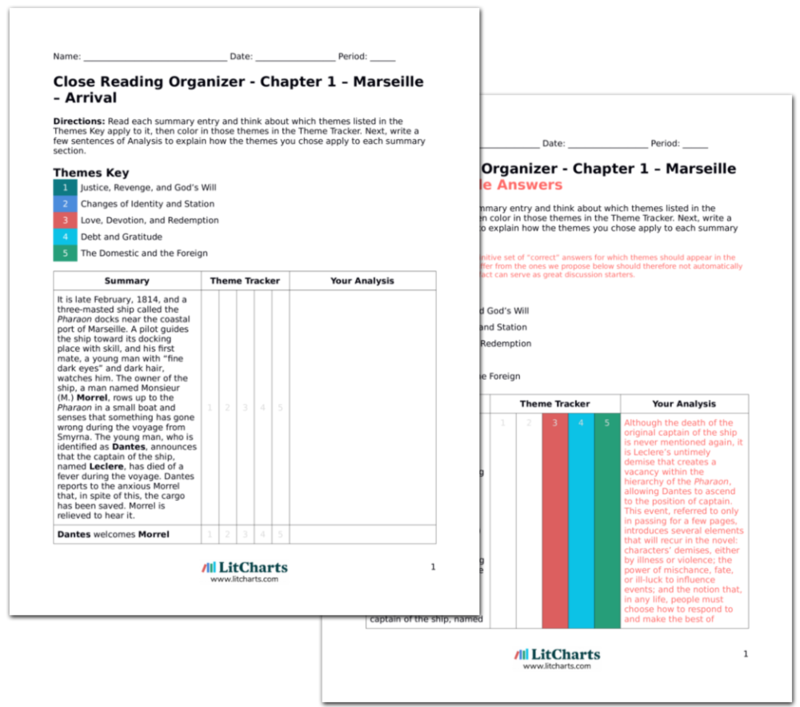 Get the entire The Count of Monte Cristo LitChart as a printable PDF. The French Revolution began in 1789, when representatives of France’s middle classes (those with some wealth but without noble titles and inherited land) demanded a set of reforms to the French government that eventually included the abdication of the King, Louis XVI, and the creation of a government by common people. Many supporters of liberal representational democracy in France and across Europe and the world were initially hopeful that the French Revolution would establish a stable France ruled “by the people.” But the Revolution did not take this route. After several years (and the execution King Louis XVI and his Queen, Marie Antoinette), the Revolution devolved into the Terror, in which competing factions jostled for control of the government and country. The Terror was finally quelled by the rise of an obscure Corsican named Napoleon Bonaparte who “exported” the Revolution to other countries in Europe, by way of military combat. Napoleon’s rule, however, did not last very long. England, and other countries in Europe led by monarchies, joined forces with French troops loyal to the deposed king and queen (the Royalists). They eventually defeated Napoleon at the Battle of Waterloo, in 1815, causing him to be exiled to the island of Saint Helena. The French “Restoration” (of the royal family related to Louis XVI) lasted until 1830, and it is during this period that The Count of Monte Cristo is set. The Restoration was characterized by a moderate amount of political consensus and predictability in domestic matters, as men in power tried to appease both conservative, pro-monarchy factions and those who, in the first part of the 1800s, had been loyal to Napoleon and were now established in the bureaucracy and military. The Count of Monte Cristo’s political and historical events capture these tectonic shifts in France from the end of the 1700s until approximately the end of the Restoration period. The Count of Monte Cristo is a classic example of the mid-nineteenth-century European serial adventure novel. These novels had large casts of characters, complex plots with numerous intertwined subplots, and central dramas involving love, revenge, and shifts in class or identity. Serial novels were published in segments (usually in chapters) over days, weeks, or months, before being collected in bound volumes for sale all at once. In England, Charles Dickens’s Oliver Twist (1837-9) and Great Expectations (1861) followed this template, as did Dumas’s own The Three Musketeers (1844) in France. The Count of Monte Cristo can also be classified as a historical novel because it chronicles a mix of real and invented events in France in the early to mid-1800s. Similarly, Dickens’s A Tale of Two Cities (1859) dramatizes, in fiction, the bloodshed of the French Revolution in Paris, and Middlemarch (1871-2) tracks shifts in English political, legal, and social life around the same time that The Count of Monte Cristo is set. The Count and The Three Musketeers stand apart for their gripping pace and their stacking of one tense event atop another. Even the most action-jammed of Charles Dickens’s works (like Oliver Twist or A Tale of Two Cities) tend to pause for longer stretches of description, of a physical scene or person. But Dumas flings headlong into duels, balls, violence, and episodes of happiness and surprise. Adaptations. Numerous film adaptations of The Count of Monte Cristo exist, including a 2002 version (dir. Kevin Reynolds), a 1998 miniseries (with Gerard Depardieu), a TV show (1964, on BBC 1), and a sequel, not derived from Dumas’s work, called The Son of Monte Cristo (dir. Rowland Lee, 1940). Schlegel, Chris. "The Count of Monte Cristo." LitCharts. LitCharts LLC, 10 Jun 2018. Web. 23 Apr 2019. Schlegel, Chris. "The Count of Monte Cristo." LitCharts LLC, June 10, 2018. Retrieved April 23, 2019. https://www.litcharts.com/lit/the-count-of-monte-cristo.